are planets like the ones in our own solar system. like we do on Earth? and not too cold. It’s just right. Our very own Goldilocks planet . . . .
Curtis Manley grew up in Pennsylvania, where there were bears in the woods (and perhaps a few dinosaurs at school). But he never had to outrun sharks during recess—though he’s absolutely certain he could have. He is the author of Shawn Loves Sharks and Just Right. Curtis now lives near Seattle, Washington. Jessica Lanan has long been enchanted by the mysteries of the cosmos. Exoplanets are too far away for her to visit, but illustrating them is the next best thing. 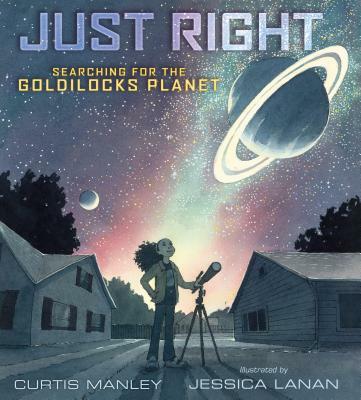 Jessica currently lives in her native state of Colorado with her husband, three-legged cat, and baby daughter, who was born during the making of Just Right: Searching for the Goldilocks Planet. Jessica's illustrations can also be found in Finding Narnia: The Story of C. S. Lewis and His Brother Warnie.